Fact: Senior guests are less mobile, more likely to slip or fall, and might have issues with dementia and medical conditions. Elderly house guests have special needs, and sometimes hosts also need to be caretakers. If you have an elderly person scheduled for a visit, short or long, below are some things you can do to make their stay in your home a safe and pleasant one. Remember, your home might be unfamiliar, physically challenging and a little disorienting. First, talk with them in advance or, if they have one, speak with their usual caregivers about their special needs and personal preferences, and get organized. If your senior guest can sleep on the main level of your home they will appreciate not having to deal with stairs, even if a thin/lumpy pull-out bed is the only option. If you can dedicate a bathroom on the same floor, your senior guest they will appreciate the privacy and comfort. Temporarily clear out your or your family’s toothbrushes and other bathroom items and relocate them. It will really make them feel welcomed. Show them where all the light switches are around their sleeping area, in case they get up in the night. Seniors are more likely to wake up in the middle of the night and also to wake up early in the morning – perhaps before sunrise. Since your home is unfamiliar, finding light switches in the dark can be hard for your elderly guests, just as it would be for anyone. 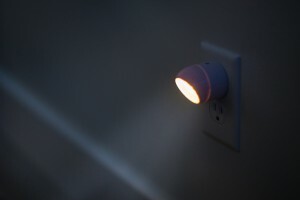 For safety and convenience, consider plugging in nightlights to illuminate the path from their bed or bedroom to the bathroom and kitchen. Slips in the bathroom tub or shower can be prevented by the easy addition of tub floor grippers that suction to the bottom of the tub they will be using – a quick and easy temporary installation. Senior guests can get cold easily, and it’s nice to have extra blankets handy near the chairs, sofas and tables where they will be watching TV, reading or doing projects / games. Your elderly house guest might have a pill organizer and an important pill-taking schedule to keep. Some seniors might forget to take pills when they’re supposed to or forget they already took them and attempt to take a potentially dangerous double dose. Talk with your guest and agree on a good place to keep their pill organizer that’s also out of the reach of children, who can assume medication is candy. Depending on their level of independence, you might want to write your elderly house guest’s medication schedule down and pin it to the fridge so you can help them keep their schedule. It will also serve as a quick, easy reference for them, as well. If your guest is unable to walk as far as they used to, you can rent a wheelchair to make certain day trips possible. Elderly guests might be happy to enjoy the mall, casino or large outdoor event if they knew they wouldn’t have to walk too much during the trip. Seniors tend to eat smaller meals and snack more, so getting them familiar with the layout of your kitchen will be very helpful. Where are the crackers kept? Where are the bowls and how do you get the ice? Plus, not any food will do. Find out in advance what food to stock and what kinds of meals you should plan. Health issues, like diabetes for example, can mean there are dietary restrictions to take into consideration when meal planning. Ask them, or their regular caregiver, what they like to snack on. Allergies and food preferences are important to know, too. They might drink decaf coffee and you normally don’t, or have a favorite tea or pop. Entertaining house guests is fun and rewarding, but it also means less time to keep the home clean and shiny. When you hire Molly Maid, we guarantee your home will provide clean, comfortable surroundings, while you enjoy your special company. Find your local Molly Maid on the pro page or call (855) 909-9865 to ask about home cleaning services that meet your schedule, budget and cleaning needs – either before or after your house guests visit!